Any recurrent income you may receive (employer wages, Social Security benefits, investment dividends, etc.) can usually be converted to a Direct Deposit, where your money is electronically deposited directly into your account. 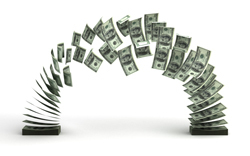 Your checks are electronically "cashed" and available to you immediately! Not only is it safer for you, it's faster and easier too.